The current delight from the MRX most boring waterways pictures calendar 2010. PLUS: Baz says to remind everyone it's your last chance to vote - with your cash - whether he should keep his flowing locks for at least another year, or be shorn now (but not before he's taken his Grade 8 singing exam on Monday because, as fate would have it, one of his pieces is from Sampson.) Go to his website to find out more and donate and vote. One of my missing Resnick novels that I didn't get to read over Christmas. Slightly disappointing after all the anticipation. Much better. More involving, more convincing. Perhaps the series gets better as it goes on. Part history of council housing; part memoir; part polemic. Marvellous. Another hit - with bodies in the canal, including one at Worksop - I could picture that vividly. What more could one ask. Picked this up because the one of hers I read last year was pretty good. Not so this - completely unengaging and a real struggle to finish. From why you can't take photographs in Paddington Basin (what first alerted me to the privatisation of public space), to the planned demolition of hundreds of thousands of perfectly serviceable terraced houses whose only fault is that they're not profitable, to why they are likely to be replaced by estates that look like prison camps, and how Britain has more CCTV cameras than the rest of Europe put together and still the most insecure and unhappy people - an articulation of everything that is wrong with a planning policy that puts profit before people. Tails off a bit in the final section, but... my book gets a mention! Terribly sad, sometimes to the point of being over the top, but some beautiful descriptions of feelings and turns of phrase. Never sure what to make of Dalziel and Pascoe... touches of comedy and sometimes downright weird. Lots of entertaining reading in this, but I think I like a bit more credibility to my police procedurals. Ligthweight but reasonably engaging mystery of the Sinister Village genre. I've decided to do this every month now. It should keep me from reading the most egregious tripe, knowing that I have to publicly confess to it, and it is nice to look back on a record of those books I've read which would otherwise be instantly forgettable. So, that's seven works of fiction, of which five were crime novels, and two non-fiction, at an average of slightly more than two books a week. And that doesn't include work reading (although the two non-fiction ones this month were relevant to work) - unless it's a pleasure as well. Where do I find the time, I hear yoy ask. Well, apart from three hours on the train each day I go to work (three or four times a week, that accounts for most of it)... how do you find the time to watch TV? I hardly know what to say. Checking in this morning I spotted that Blossom had a new post, on a topic close to my heart, and as I can never wait to read his wonderfully knowledgeable and entertainly written posts, I clicked straight through to this. By the time I got to the end, and realised what he had done, I genuinely did have a tear in my eye. I have met Blossom once, and that incredibly briefly, with no time for more than the quickest chat, at last year's Black Country Museum gathering. In that sense he is indeed a stranger. But didn't I really meet him back in 2007 or thereabouts, when he left his first comment on nbWarrior, pointing out some error I'd made - but as always, with such tact, such obvious knowledge and devotion to getting it right, that, very unusually, he instantly won my respect. Whatever else the internet may be, it is, in my experience, somewhere where you - especially the shy and the awkward among us - can make real friends and meet some wonderful people. And I understand absolutely what he has done, and why, and gladly accept it in that spirit, in the hope that one day I will be able to do something similar, if not for Blossom, then for someone else. Thank you Blossom, from the very bottom of my.... bucket? Before we took up boating, out main weekend leisure activity was going to jumble sales. I was introduced to this rewarding passtime in my teens, by my friend Penny, much to my mother's lower middle class horror. Back then I mostly used to buy dreadful clothes for being a teenager in. In recent years though things have tailed off. 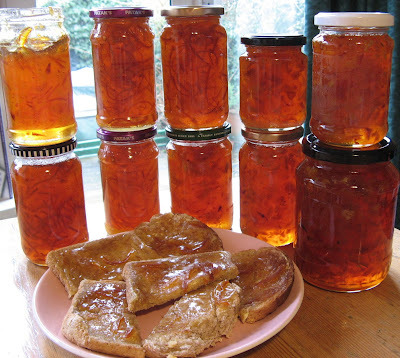 Fewer jumble sales take place - partly because of the costs of getting rid of the unsold stuff. There is less stuff to sell, because people can ebay it, or Freecycle, or take it to the charity shop or sell it at a car boot sale, rather than waiting for a local cause to come and collect it. For the first time in ages, I strolled down the road last Saturday to the local Lifeboat jumble sale. We were promised great things, but it was very disappointing; mostly just a load of rubbish and very few clothes, all of which were dreadful. I came away with a (brand new, boxed) Prestige wall-mounted tin opener, an aluminium measuring cup (period piece for the boat), and a set of Tala metal pastry cutters, which I don't need but they were in such good condition. Baz bought a novelty folding clothes brush which is entertaining but totally ineffective, and we clubbed together to stump up two quid for a new multi-storey cage for Aaron's hamster, Beanz. I think that the glory days of jumble are over, but I have some great souvenirs. We all arrived full of enthusiasm, bright of eye and very bushy of tail despite quite a snow fall overnight. Without exception we all found Saturday tiring but were looking forward to what we all perceived to be the more difficult of the two days. And so it proved......as the landscapes are more technical by far, full of shading and perspective as well as Bradford Bean Can Theory. We did however have one major problem, the room was considerably colder than yesterday so much so that the paint was not drying properly despite us using proper quick drying flat paint. This is necessary, otherwise the various colours will either bleed through or drag, this should only happen if you want it to. Phil was getting frustrated by the slow progress caused by the non drying paint so he arranged for Zita to bring over the office halogen heaters which which was all well and good but he neglected to tell us that the office heating had broken down and poor Zita had to do her work of reorganising the office in the cold, so respect to her as yoof of today would say. These heaters made a world of difference and our work quickly dried enabling us to try and catch up what Phil estimated was a loss of over an hours 'production' meaning that we were unlikely to finish our work properly. We pressed on, fueled as yesterday, by copious quantities of tea, biscuits and rolls and more tea. Success was in sight at last and almost on time as well but we still had to endure Phil's bear hunting joke, and endure it we did and him being the son of a music hall comedian. 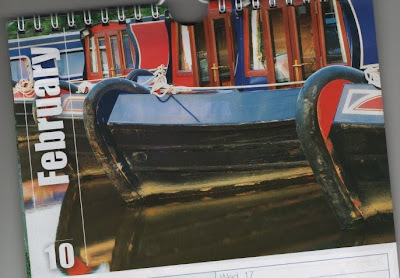 Please note : for a much more objective appraisal of this wonderful weekend please keep an eye out for Jill's forthcoming article in Canal Boat complete with pictures in glorious technicolour. Don't ask are there any Italian motorbike makers? or say Formula One is rubbish. Other than that sign up and enjoy. Oatbix(?) devoured we were all ready for the day and off we set in the Volvo laden with large quantities of rolls and good intentions. 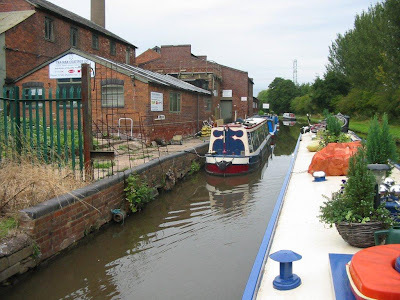 On arrival at the Stourbridge Canal Wharehouse, the venue for our weekends fun, the rumours of much chillyness proved fortunately false. a silence that you could cut with a knife enshrouded the assembled throng - this was the natural course of events over both days, somehow Phil's very casual manner held us all enthralled despite regular mobile calls from some people installing a paint mixer breaking the spell and his general inability both to work his mobile and find his glasses, Each process, there were about 8, was explained and demonstrated and then it was our turn................. and an even greater silence ensued, as we all sort to put into practice each of the seemingly simple? processes. There was none of the usual mickey taking or competitiveness, just surprisingly focused work. Much tea was consumed, biscuits eaten and at lunch 'our' rolls received a surprising good reception. Met up with Tiggy Madcat, a fellow 'student', who owns Halsall, a big Northwich which spent a considerable amount of time in Chertsey's company at Les Allen's in Oldbury but now lives in Hawne Basin, lucky thing. Not only did boat talk but she said she was a big fan of the heavy rock music, especially the Groundhogs, a band with whom I had a short term aquaintance. We were all inspired so lunch was short and we were soon hard at it again, although still somewhat confused by the elusive roses or flowers as they should be known as. Everybody had achieved the same level so far, a tribute to both the tutors and the concentration and hard work of all the participants. The roses continued to evolve but not as we would know them and certainly not with the 'life' of Phil's but press on we did until as if by magic and following the final process our 'roses' came to life with a general and very particular satisfaction. * This was the word Phil used which proved very true. 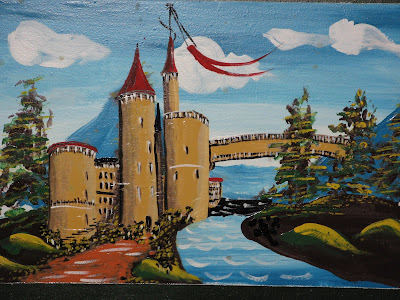 As part of his Christmas present (along with some rather fine new dungarees) I sent Jim on Phil Speight's 'roses and castles' painting course. 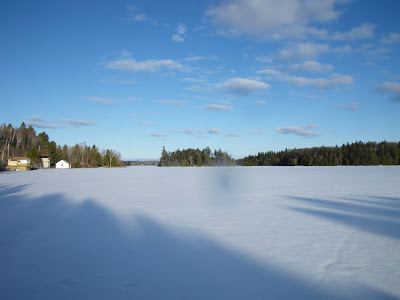 And here is his report (well, part one of it), in which we don't even get near a paintbrush, so I have the comfortable feeling that this will keep me in posts for a few days yet. any of their usually very limited knowledge. one to blink bought it. talking to a customer in the 'Nelson' at Brauston. On November 11th 1998 I first became the parent of a teenager. And today I cease to be one. It's all a bit sad really. Eighteen and twenty-one are supposedly the iconic birthdays, but such a thing is made of the whole concept of teenagerhood that the twentieth birthday has an often overlooked significance. And his twentieth birthday is what Baz/Sebastian/No.2 Son/Lockboy has today. Read the supposedly quality press and you would think that being the parent of teenagers was an unremitting nightmare of slammed doors, rows, binge drinking, drug taking, unwashed squatters, staying out all night, shoplifting and shouted abuse - and that's just the middle class ones. Well, Baz is very untidy. But I really thought that Julie Myerson's anonymous Guardian column on living with teenagers was a spoof, so outrageous was her children's behaviour. I don't know whether I've done something right, or just been terrifically lucky, but living with my teenagers was rarely other than a pleasure. I could count the rows with both of them put together on the fingers of one hand. Wish I knew what the secret was. Anyway, now I don't have to worry any more about having teenagers... Adult offspring though, now that's a whole new ball game. I'm taking advantage of having the house to myself to cook a bit of lamb for my dinner. This is de facto a vegetarian household, all of us at various stages having been ethically and ideologically committed to the veggie cause. I was veggie for fifteen-odd years and vegan for two of them (it was going to Huddersfield that put paid to that) and I still believe that really veganism is the only morally and environmentally sustainable position. But I'm not perfect enough to put what I believe into practice, at least not all the time, although I like to think that I do my bit. Anyway, what I realised is that if it's the environmental and animal welfare issues of factory farming that are your motivation, being a lacto-vegetarian (i.e. someone who avoids meat and fish but eats dairy products and eggs) is no better than occasionally eating a bit of meat - especially if it's small scale reared, free range and organic. There's a hell of a lot less animal suffereing and environmental devastation in that than in mass produced milk, eggs and cheese. However, as I have lapsed, Baz has become much more hard line (having read Peter Singer), and Jim, while he also has occasional lapses (mainly around Nightingales steak pies in Atherstone and the odd steak in the Bridge at Brewood - see, it's all the fault of boating) he still tries to get himself back on the straight and narrow. Whereas I now feel no guilt about the occasional meaty treat, knowing that most of the time we all subsist on lentils and vast quantities of seasonal vegetables. 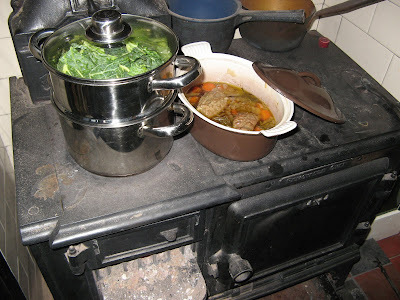 All of which is leading up to the fact that I decided to cook my entire meal tonight - lamb braised with vegetables and rosemary, mashed swede and steamed cabbage - on the solid fuel stove, in order to get in some practice for cooking on Chertsey. The stove in our kitchen is a 'Belle portable oven', about the same size as a Stratford range. That is bigger than the Epping I will be having in Chertsey but similar to what might have been fitted in a larger butty cabin. The principle is pretty much the same, although being open fronted it's a bit harder to control, not having a damper* to regulate air flow at the bottom of the fire. I started off getting the stove nice and hot with plenty of coal and a good draft and put the pot on it to heat up. When I could smell that it was hot I put some oil in and browned the lamb. How satisfying to hear it sizzle without having turned on the gas! Then when that was browned I took it out and kept it warm on a plate on the stove top, and fried an onion, a stick of celery and a couple of carrots for a few minutes. Then I put the lamb back in on top of the veg, tucked in some sprigs of rosemary (the only herb I can grow so it's nice to have a use for some at last) and poured over some stock, then put the lid on. I then moved it away from the hottest part and kept an eye on it, shifting it about to find the optimum spot for a gentle simmer, and moving the lever* that distributes the airflow either up the chimney or around the oven to its half way position. All that was an hour and a half ago, and it's looking and smelling lovely. Now I have to go and get things hot again to boil the swede and steam the cabbage. I'll report back later on how it worked and what the end product was like. Postprandial update: Well, it did take a long time to get it hot enough to bring the water to the boil for the swede (lesson - start sooner) but it got there in the end, and the lamb didn't mind waiting and nor did my appetite. I can report that the end result was quite delicious, although there was perhaps a little too much cabbage. photo courtesy of Mike - I never took one, of course. Following on from yesterday's cliffhanger (yeah, right), my new mooring agreement arrived in the post this morning, so I have signed it and sent it back, and hopefully (provided they don't mind waiting a little while to see my insurance, ahem) it will all go ahead. 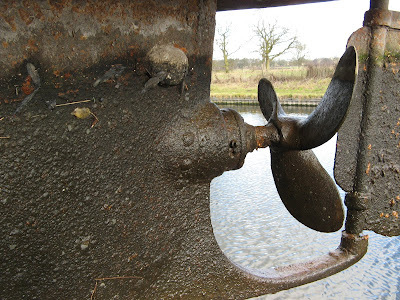 Thanks very much to Blossom for keeping his ear to the ground, Chertsey will tie up on a home mooring just behind Minnow, at Kings Bromley Wharf on the Trent and Mersey. It's a long way from home (but where isn't) but it's a lovely central spot canal wise and though I've taken the mooring sight unseen (been past it a few times but never really looked), the fact that it has water, electricity and secure parking, and is offside and gated, would seem to make it a good bet. 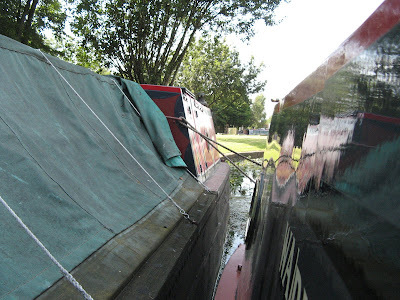 I was never 100% happy about considering towpath moorings, although I did of course and they probably would have been fine. But for hardly any more money than those were going for this seems to have a lot more going for it. Also I like the fact that it's a proper wharf, with a bit of history to it. I hope Blossom won't mind me paraphrasing (from memory) the brief history he gave me - the site was originally a creamery, and used the wharf for deliveries of coal from Rugeley. 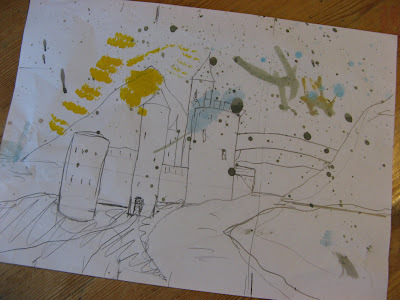 It's now an industrial estate, so a big contrast to the rural splendour of Bill Fen, giving us the best of both worlds. It'll still be a long(ish) time before we can make our way there of course (but the mooring agreement doesn't start straight away) but it's nice to think that Chertsey has a fitting home to go to. A big boat needs a big mooring, and hence I have been keeping a watchful eye on the British Waterways moorings auction site for quite a while. Occasionally a 22 metre 'berth' comes up - sometimes even with an available depth of more than 70cm. And when that happens, off I set on a mystery tour... to Weedon, Banbury or Wolverton, say - to see what the mooring's like, and to have a look at the local town and facilities, to see if I could see myself being based there. And on a couple of occasions I have come back and bid. The policy of auctioning moorings like this is of course highly questionable, but it has to be said that (in my experience at least) the site works very well. Obviously, from the fact that I keep looking, I have not yet bid successfully; I have in fact been outbid on two moorings so far, both of which have gone over the guide price, and the most recent one, that I didn't bid on, went way over. Yet I also hear of moorings not reaching their reserve, including one of these full length ones, the first time it was offered. Taken across all the moorings, the auction system, which sets the guide price at what it's currently bringing in, and the reserve somewhat lower, may not be inflating prices, but my recent limited experience suggests that it might be at the bigger end of the market. Certainly I was priced out; I wouldn't pay over £1,600 a year for a towpath mooring with no facilities and no security and in the case of Wolverton, not even any rings. I could, in theory, take Chertsey to Bill Fen, where Warrior resides, and pay the grand total, including VAT, of £846. And maybe I'm mad not to. But getting up and down the Nene, and round Whittlesey Dyke, is pretty theoretical in a boat like Chertsey. Not impossible, certainly - ask Fulbourne - but not the sort of thing you want to be doing two or three times a year or more. So I decided to bite the bullet and look for somewhere more central. 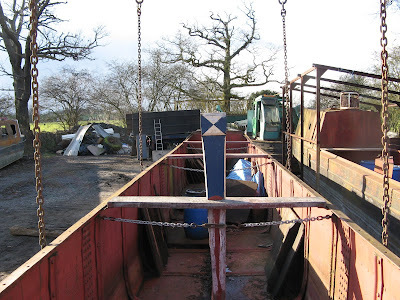 It's a canal boat, for heaven's sake; it needs to be on the cut. And I want it to be not only within relatively easy reach of home (a lot to ask given where I foolishly decided to be born and brought up) or at least of London, but also of the rest of the canal system. And I think I've found somewhere. It's not signed and sealed yet, so I'll save that for another time, but I'm glad that I ventured into the world of BW moorings. It was an interesting experience, and a nice excuse for the occasional day out. But I must confess to being gratified, as well as amazed, to see Chertsey zooming up the charts in the last few days, culminating in the dizzy heights of actually overtaking (by a few clicks) the venerable Bones last night. I certainly never thought I'd see that day. I took a screen grab to save the moment for posterity - fifteen in the overall chart and FIVE in the blogs chart. I can't see it getting any better than that. It's fascinating following the chart, and Chertsey's progress in it. It really does seem as if more people look when I write about something interesting - particularly Chertsey itself (which is nice), than when I'm just wittering on to fill space - but how do you know it's going to be interesting, before you look? Or is it that on the more substantial posts, people look more than once, come back to make a comment, see if there have been any new comments. Because that is something I have been really chuffed by - the fact that so many and varied people are commenting. 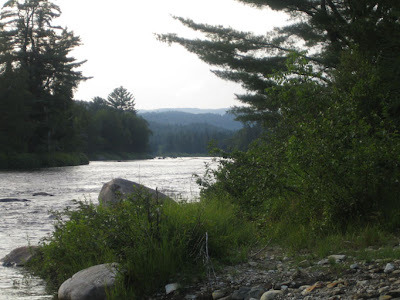 My first experience of blogs - one I stumbled upon completely by accident (yes, I know - science! Me! I found it while searching for information on Amitai Etzioni, and that day it featured a post about how wonderful the stoical British response to terrorism was... and I stayed for the atheism, although I hadn't visited for ages until today. It hasn't changed much, and I'm going to go back and have a read as soon as I've posted this) - was characterised by the informed and often heated conversations that went on in the comments, and that's always stuck in my mind as part of what blogging is about - a conversation, not just a series of one-way announcements. So if you read this but haven't commented yet, why not say hello? It would be lovely to know who else is out there. So, I bet it'll start slipping down the chart again now I've posted this load of empty ramblings. Never mind, I've had my moment of glory. 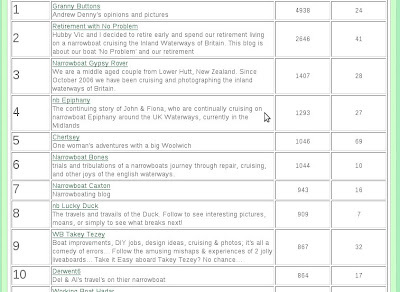 I've just checked the National Historic Ships Register website, and Chertsey's entry is now up there. Interestingly, the historical details which I painstakingly typed into the little box have been cleverly edited (possibly by a robot) to make it look as if they have been translated from Mandarin. No matter; you, dear reader, are not likely to think that I really write like that. The measurements, in the column on the right, are another matter, though. I recall Halfie commenting how, on the certificate, the length had been transcribed into a metric measurement, to four decimal places, that bore no visible relation to the 71'6" which I had entered. And we can now see why. 71'6" has been rendered as 71.60 feet - OK, so that's only about an inch out and for all I know is more accurate anyway. But look at the beam - my 7'1" has been turned into 7.01 feet - it's lost nearly a whole inch where it really matters (I can go up the Llangollen after all!). I do accept that this doesn't really matter. But. In some ways it does. What is the point of presenting something to four decimal places if it's not accurate? What, come to that, is the point of measuring a bloody great boat to four decimal places, when you haven't measured it anyway, only converted it from the much cruder measure of feet and inches. And what on earth are they doing expressing feet and inches in decimals? It's depressing because you'd think that they of all people would firstly want to get things right, and secondly would be satisfied with presenting boats that were built in feet and inches in feet and inches and so avoiding getting themselves into this mess at all. Now, I have nothing against metrication. I am one of that fortunate bilingual generation who spoke metric at school and imperial at home, and annoy purists by using a mixture of both (ooh, that's seven and a half inches by 28 mm). I tend to measure in whatever fits best, although I visualise lengths better in imperial. But I am intensely annoyed by the insistence of the Guardian and the Observer in writing their recipes only with metric measurements. Metric may be good for many things but it is crap for cooking. For a start, if you used balance scales, you need more weights, because you have to have 2 x 200 and 2 x 20, and they don't stack neatly on top of each other. Scaling up or down is so much easier with imperial, because it's based on doubling and halving. But the worst thing is, it is obvious that quantities in recipes are still at some point being converted from imperial (with 25g being substituted for an ounce, even though 30g is nearer the mark) and you end up with all these odd little 5 gramme bits. Now, unless it's poison, or possibly something really expensive like saffron or gold leaf, five grammes is nothing, it's insignificant. But how it bloody complicates things, especially to someone like me who glazes over at the sight of too many numbers. So if you want to write recipes in metric, invent them in metric, with nice round figures, rather than inventing (or more likely discovering them) in pounds and ounces and then converting them. And the same goes for you, National Historic Ships Register. If you want to know what my boat measures in metres, come out with a metric tape and measure it. Which wood would be good? I'm very lucky in that Chertsey has a lot left about it that's original, and more that, while not original, is pretty old and traceable to its working history. Even if this wasn't the case, of course I'd want to restore it sympathetically and make it look right; the fact that it is makes me feel even more keenly the responsibility to make sure, as far as practically possible, that it not only looks right, but is right. So, the gunnels will be wood. At present it doesn't have any, but the hull sides are dead straight and there's no structural need to put steel ones on, so from the start I was determined that they would be made of wood. The question is, what sort of wood. Originally they would have been oak. Everyone seems to want to warn me off using oak though. Mainly this seems to be on the grounds that the tannin in oak reacts with the steel mounting (what is the proper name for that?) and the bolts. What I haven't established yet is whether this reaction merely causes discolouration (not really a problem as the whole lot will be tarred or otherwise blacked) or whether it actually contributes to the corrosion of the steel. Or maybe it makes some compound that attacks the wood. Even if the latter, I'm wondering can they not be isolated from each other? The wooden gunnel will in any case be bedded into some suitable waterproof compound, and it must be possible to sheathe the bolts (or use stainless ones, except Jim already has a hundred otherwise suitable bolts left over from a job where the building inspector changed his mind, as they so often do). Many people seemed to have successfully used tropical hardwoods - kerouing is one that frequently pops up in conversation, and apparently goes by other names according to where it's grown. I know this is what Dave and Izzy used on Bath and their gunnels still look fine after more than twenty five years, but... Firstly... tropical hardwood... no matter how sustainably grown (and we haven't yet tracked down a source of sustainable kerouing) still has to travel a long way; and I would always have doubts about claims to sustainablity anyway; it's such a complex area. And secondly, my heart tells me it should be oak, for authenticity, unless there's a really good reason for it not to be. Is it cost perhaps? Oak certainly isn't cheap. Jim was researching this at the weekend and good quality English or European oak is going to work out at around £600 for the quantity we'd need. Now, to be honest, that doesn't sound too bad to me, in the scheme of things. Maybe the tropical stuff would work out cheaper? But I don't think I want to know. Is it durability? How long would oak, properly maintained, last? My first post about Warrior this year, and the first post on this blog to be tagged 'Warrior'. How can this be? Well, I haven't set eye or foot on Warrior since I waved Jim off from Stretton following its blacking back in October (indeed, until last week I'd not been back to Chertsey since then either). Jim has been over to Bill Fen a couple of times though to keep an eye on things and meet up with Moomin, and returned last week with the news that the start battery is knackered, which is a bit of a shame but not the end of the world. It's done four years service so things could be worse. All we have to do now is find a new one before Easter, because at Easter we will be off on our Warrior travels again. Yes, we are finally getting our act together to go back out onto the Great Ouse and thence into Cambridge, in convoy with the Moomins, and meeting up with the Ducks - on their new city centre mooring! - and their friends, and hopefully also the instant friends we made when we were last there in 2007. I'm a bit torn, as really I should be spending Easter at the HNBOC gathering in Coventry, or up at Ellesmere Port, poring over other people's wooden gunnels and asking them where they got their cloths made, but after the long cold winter, who could resist a bit of spring boating (just hope it doesn't snow at Easter again like it has in previous years). ... may not very often cost lives, but can cost friends, respect, and, most easily of all, accuracy. As an academic, this is something that I should know well, and indeed, do value very highly. Don't say something that you can't back up; where's your evidence for this; where is your argument; in short, don't just assert something, but give me a reason (preferably more than one) to believe it. And then, when I come home and dash off a blog post, I forget my own rules and values in my rush to write something readable that doesn't make me look like I'm too far up my own arse (an ever present fear, I assure you) and end up stating for posterity something which a moment's thought would have revealed to be inaccurate. I said yesterday that my monkey box was 'crudely made', and was, very rightly (and not for the first time, but nicely as always) pulled up by Blossom for this solecism. 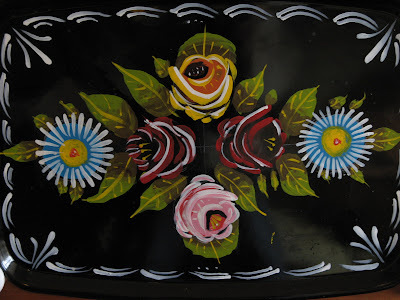 It is not crudely made; even in the photo you can see that it is very neatly put together; the lid fits beautifully; it is completely solid with no wobbles or loose joints or gaps. Even I, who know next to nothing about woodwork, can see all that. So what was I thinking of? OK, here are my excuses. Not having an instant eye for woodwork, these factors didn't immediately come to mind. They were, in a way, taken for granted; unappreciated. What I saw instead was the simplicity of the design; the open back and sides (perfectly suited to its intended positioning and use), and its general chunkiness. A moment's thought should have told me that this didn't add up to 'crudely made', but I didn't give it a moment's thought, and therein lies the lesson. 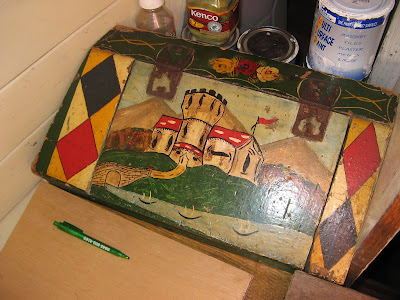 So my apologies to Roger Hatchard and those who know him for carelessly maligning his craftsmanship. I know that by blogging at all I will always be giving hostages to fortune; and I am gradually learning not to mind displaying my ignorance - because I want to learn, and you can't do that if you think you know it all already (and how could I know anything but a tiny fraction of what there is to know, in so short a time? ), or even if you pretend to know more than you do. Of course like everyone else I've been guilty of nodding sagely while something goes completely over my head, but I hope that more and more I will have the confidence to say, hang on, I don't really know about that, could you tell me about it... And people who really do know what they're talking about will, in my experience, be more than happy to do so. And why then do I blog, given that it's suce a potential minefield? It started out as a way of keeping a record for myself, a sort of diary, literally a log, in fact. It was also intended as a way of keeping family and friends up to date with what I'm doing, boat wise, but they've turned out not to be all that interested :-( It's because like many bloggers, I'm a wannabe journalist; I love writing for an audience, putting words together for best effect. It's light relief from academic writing. And what it's turned out to be, quite unexpectedly, is a way of 'meeting' other people with similar interests, tales to tell and information to share. Of course I will continue to put my foot in it from time to time - and to be mortified when I do - and I hope they will forgive me. I took the opportunity on Wednesday to take a couple of (pretty dreadful, as they turned out) pictures of my monkey box. Now, last summer, when we met Hawkesbury, newly bought, at Fradley Junction, and I got chatting with the steerer, when I told him I had just acquired Chertsey the first thing he said was 'You've got my monkey box!'. 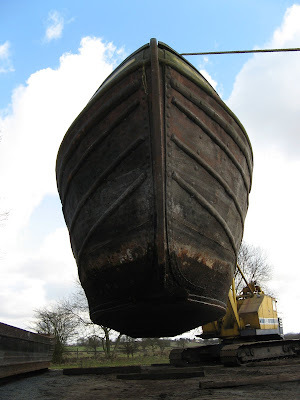 Indeed, when I first went and saw the boat, it was described as 'Hawkesbury's monkey box.' But it ain't. As far as I can gather, something like this, like water cans, would be the property of the boatman, not part of the boat, and this one certainly is, having heard its history and how it came to be in Chertsey. It was made by Roger Hatchard, when he did indeed have Hawkesbury, but when he swapped his G.U. for a josher it didn't fit, so he gave it to Richard Barnett for Chertsey, and it's come to me along with all the other odds and ends on board. It's nice for me to have something with a connection to Hawkesbury, as my surname is the same as the name of its original (official) butty. To be honest it doesn't fit perfectly on Chertsey, it's crudely made [but see comments for clarification] and painted, but as a bit of history and a nifty hidey-hole, I love it. To be honest some more, until I saw this one I hadn't even heard of a monkey box, so I asked on CWF about their origins and uses, and a long and learned thread ensued. 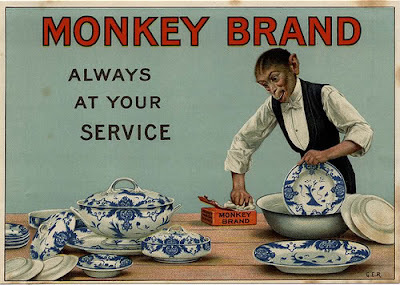 The general consensus seems to be that they were used for storing cleaning materials and rags, possibly because there was a particular brass polish called 'Monkey Brand'. Looking at it through female eyes though I find this rather unconvincing. The monkey box (open at the bottom and at the back, though this might not be typical) sits on the side bed, tucked into the corner adjacent to the door. It's a safe and relatively clean place; why waste that on storing cleaning materials which could just as easily be kept in the boot cupboard, under the side bad or even in the engine room? Furthermore, brass polish tends to come in bottles - and I think always has had - which would be too tall to store upright in the monkey box. 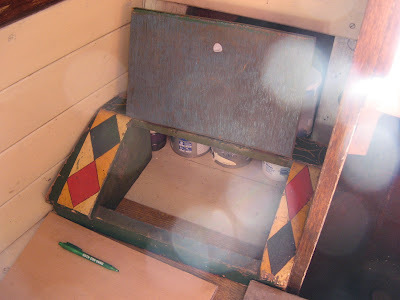 One person suggested that an alternative name was 'pillow box', which severs the Monkey Brand brass polish connection, and - although I'm very prepared to be proven wrong if there's any evidence to be produced either way - I'd be far more inclined to think of it as a relatively safe, covered, clean place for storing treasured possessions. I admit that that is purely intuition, and I would love it if someone could come up with something conclusive to demonstrate their use - and indeed, how widespread they were. In the meantime, I'm afraid I shall be keeping my little treasures in mine. A little bit scabby and flakey, perhaps, but what do you expect at that age. ...I can say that there have been no nasty surprises yet. Some surprises -or semi surprises - but not nasty ones. Firstly, a long central section has been rebottomed in what looks like 12mm plate. Brutal but effective. Secondly, the back end looks to be untouched - no replating there that we can see at all. 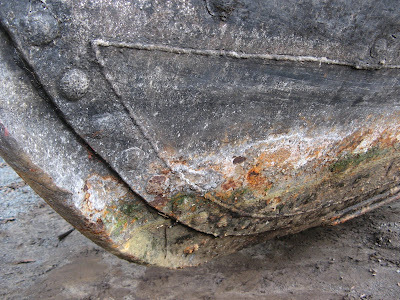 This is good insofar as it is apparently unusual for a boat to get to this age without repairs here, and insofar as it has lasted this long. On the other hand, a bit worrying, to me at least, that I might have to be the first person to do anything to it. But we shall see - if it's in as good condition as it looks, maybe not for a while yet. It was wonderful to be able to admire the curvy swim and marvel at the graceful shaping of the skeg, so unlike a modern boat's. The refooting is pretty much as we thought from looking at the inside, and looks to be in good shape. There has been some replating of the fore end - nicely let in - and again that is still looking good. More pictures for rivet counters here. Well, we have had a very exciting and successful day today. Up at the crack of dawn - but still managed to catch rush hour on the M25 - and off to Stretton. 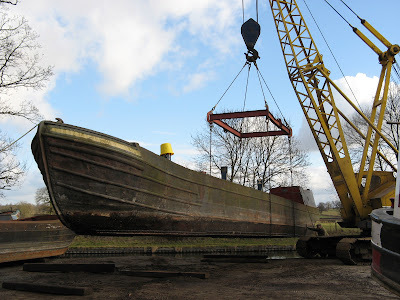 The day has finally arrived for Chertsey to come out of the water, for the first time in years, probably in decades. Just as we left the M6 Toll I got a call from Keith to say that there had been a road accident (on the A5) right outside the yard, blocking the road in both directions. Undaunted, we parked in Brewood and walked along the towpath to get there, where the crane was waiting, chains already carefully positioned and ready to go. The craning went completely smoothly and after some very patient fine adjustment, Chertsey was settled on terra firma next to little sister Corolla. Of course it was incredibly exciting to get a first look at the boat's bottom, but I'm going to save that for tomorrow. Latest: craning photos added here. Remember the poor old ugly chair that no-one loved (well, Jim liked it because it was comfy, and once I finally ousted it from Warrior, Baz liked it in his room for a while even though it did take up a lot of space and he eventually gave it up too...)? Well, it has a new home at last, where it is loved and appreciated and sat on, back in a boat. 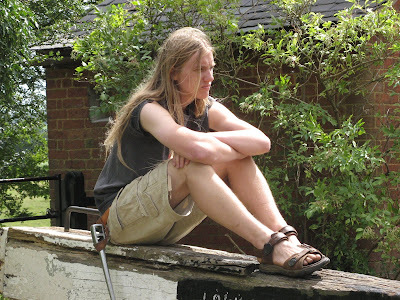 Back in the autumn, when Jim was taking Warrior back to Bill Fen, he was introduced to an acquaintance of Moomin's, a chap from Canada who works at Cambridge, lives on a boat, and had nothing to sit on. A match made in heaven for the chair, so Jim took it up there at the weekend. He has got to know Alex (for that is his name) and it transpires that Alex has a cabin (bit like we have a boat I suppose), and his cabin is in a place, in Quebec, called Chertsey. Now isn't that a turn-up? Only because it's in Quebec, and 96% of the population are French speaking (according to Wikipedia anyway), it's pronounced Shertsey. Jim found somewhere (why can I never find the same websites he does?) that said it was named after the Chertsey in Surrey... slightly less strange I suppose than randomly arriving at the name... whose derivation I must look into one day, possibly the day I visit Chertsey Museum. Not the good book - although this could well become my bible - nor a book to read on the train, but an amazing gift from a fellow boater, whom I had never met or even communicated with before but who had heard that I had acquired Chertsey complete with the mythical beast the PD2, and who happened to have an Operators Handbook looking for a good home. Isn't that wonderful. And the book is wonderful too. 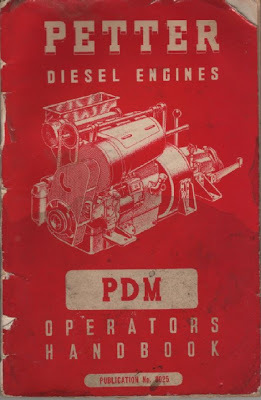 Not just because it's a detailed guide to everything you could possibly need to know about maintaining the engine, but because of the way it's written and illustrated. Decades before we started worrying about 'accessability' and 'plain English' this booklet is beautifully written, in delightfully straightforward and friendly style. It is packed with a level of detail that manufacturers would not dare provide today - and anyway, there'd be no point, because these days no-one can do their own repairs and maintenance because of the high tech and computerised nature of everything. Somewhat xenophobically, perhaps, it is wonderfully refreshing that it is written entirely in English - you don't have to wade through a dozen different language versions every time you lose your place. And it's not xenophobic really - I bet Petters produced manuals in a range of languages - the difference being that they produced a separate one for each market rather than cutting costs by foisting the same multilingual one on everyone. 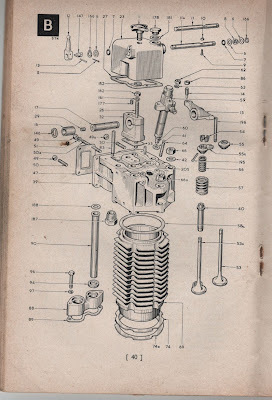 But best of all perhaps are the diagrams; every part illustrated in beautiful and stunningly clear detail and the wonderful thing is to realise that these weren't done on a computer; every single line was drawn by someone sitting at a drawing board; every line of shading deliberately added to make the drawing's message clearer. The trouble and the skill that went into them, dozens for this booklet alone, is awe-inspiring. 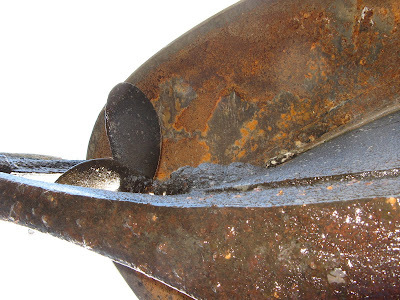 You can rest assured that this won't be going anywhere near Chertsey's engine hole. With a disregard for copyright that is most unlike me, I have phoptocopied the entire thing and am about to slip the copies into one of those display folders where each page is enclosed in plastic, and put the treasured original back in my Chertsey scrapbook. I'm sure they wouldn't mind. And maybe, one day, I'll be passing it on to someone else. Maybe this evening I'll relax by finally tracking down the last year's (or is it the last two years'?) 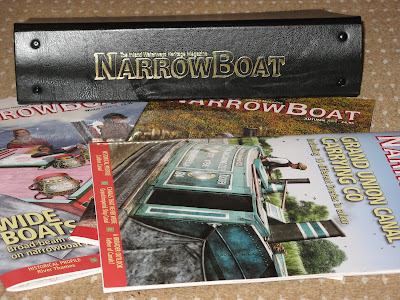 issues of NarrowBoat magazine and putting them on the smart binder that I got 'free' in return to subscribing for another two years. Interesting, these binders. Whatever publication you buy, the binders are always really dear - eleven quid or so - when any stationer can provide you with a nice ring binder or lever arch file - with more sophisticated and substantial paper-holding technology - for a fraction of that. Does anyone buy these binders, I wonder, or is their price merely a nominal one to make you think you're getting something valuable for free. Or perhaps it's the goldette lettering. Anyway, I have one, and now I have two, but no space on the bookshelf for it, so this heralds another complete reorganisation. I remember talking to Mike around the time the new wipe-clean shiny high quality glossy new connoisseur's mag was launched. How long, he wondered, over a pint in Reading, would the glossy quality be sustained before they went over to cheaper paper and less colour pics. I think I'm equally surprised that it hasn't happened yet, especially as it carries so little advertising. Being largely subscription though, and only otherwise being available from a small range of suppliers, I guess it's virtually print-on-demand. Before you ask, no, I really don't know why I buy it. I know I can get terribly excited by the promise of 'Grand Union: Sixteen Liveries in Colour' (including at least one completely non-existent one, modelled by guess which boat...) but some of it is recycled articles from ancient issues of Waterways World (all of which I possess); some of it doesn't interest me (wide boats! What a swizz); some of it I don't understand (anything with maps)... But it does have nice pictures to drool over (hence the wipe-clean pages) and lists of things like health registration authorities. And above all, if I didn't buy it I MIGHT BE MISSING SOMETHING AND I WOULDN'T KNOW. And anyway, it's shiny. And you get a free binder. I really don't want to talk about it. When I went through all my photos looking for ones to put in the album, I found a few likely candidates that I couldn't put a name to. One was only from last summer - I suspect it didn't have its name on or I would have remembered, but I've just zoomed in on its BW index number, looked it up on Jim Shead, and assuming his entry is accurate, identified it as Ascot. So woo, another one I didn't know I had! But this one, badly photographed in 2006 still has me guessing... Ideas anyone? I've finally tracked down photos of Dover and, ahem, Tarporley and added them to the album. Not many left to find down the back of the sofa now; I shall have to go out and spot some more. The one of Tarporley shows the first time I encountered it, when we had Warrior in London in 2008. Sort of 'here I am with a famous person' kind of photo. Last night was the monthly Tarporley committee meeting. The facilities on the boat are gradually being upgraded, and, in order to make the next difficult decision, I have selflessly volunteered my services as a member of the Toilet Subcommittee. The subcommittee is packed with dump-through supporters so I don't envision too much internecine warfare - until the subcommittee's decision comes back to the full committee for approval, of course. Politics - don't you just love it. Did you notice? I did manage to post every single day in January - despite going nowhere near Chertsey and having nothing substantial to write about, I still waffled on for 31 posts. Now I just have to keep it up for the rest of the year. Which hopefully will not be - could not possibly be - so fallow in terms of boating activities. Anyway, the reason I mention this now is that in February, every year, DG counts things. Inspired by this, last year I decided to do something... completely different - to record all the books I've read in February. Here's last year's list. Lucky I wrote them down; I'd have forgotten most of them otherwise. Lock Boy to lop locks? Baz has hair. Baz has had hair for a very long time. Ever since his first, rather drastic, haircut at the age of two, I swore never again. I kept it half heartedly trimmed until he was about six and then decided - as long as he was happy about it - to just let it do its own thing. Throughout his childhood this was a bit of a battle with his other parent, step parent and grandparents all assuring him (and me) that he's be much happier looking like all the other boys, and threatening him that he'd be bald by the time he was twenty. I for my part assured him that this wasn't true, that short hair for boys was a relatively recent fashion and that he was adorable the way he was. Despite all the pressure on him - and the teasing he did get at school - Baz never wavered. He loved his hair. He has grown up into an absolutely smashing, lovely young man, open, very confident and very much his own person. And he has started thinking about cutting his hair. Maybe he's proved his point. Maybe he's fed up with the washing and the brushing and the gallons of conditioner. Maybe he just fancies a change. A few years ago I would have been aghast - but now, knowing that it's his own decision, I'm just a bit sad. But all things come to an end, and once you get it into your head that you fancy a change, it's very hard to resist. I have warned him that I may not recognise him, however. All is not lost though. When Baz told his friends that he was considering this radical move, many of them (mainly female, it must be said) begged and pleaded with him not to. Never one to miss an opportunity, Baz has now decided to auction his hair, in aid of an autism charity. Basically, people can pledge money for him to keep it, or to cut it off, and whichever 'side' raises more money, that's what he's going to do, and keep it that way for at least a year. He's set up a website to handle the rush of responses and pledges. At the end of the month, after his twentieth birthday, he will do the deed. Or not. It all depends upon the will of the people.